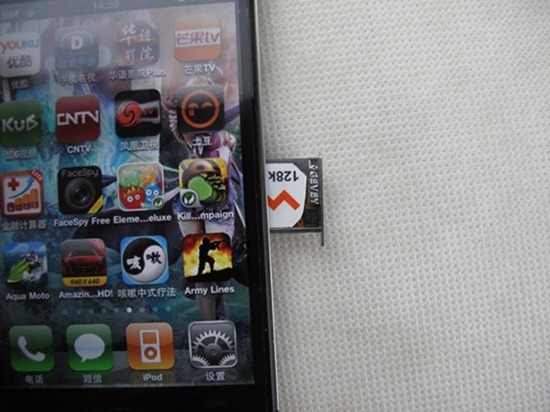 Gevey SIM is a hardware-based unlocking method for iPhone 4 which works with most basebands. Today, we received a tip from a reader who has tested Gevey SIM on iOS 5&hellip; and it works! It involves using a thinner-than-normal SIM card which actually needs to be inserted along with the actual SIM card into slot. Then, you have to follow a few steps such as dialing an emergency number (112), turning Flight Mode off and on etc. It works without jailbreaking. The method is a controversial one as its legitimacy is questionable based on the fact that it is not exactly right to misuse,we reported about it before back in March and stated that it worked only up to iOS 4.3. Well, it appears that Gevey SIMs magic still works on iOS 5. I&rsquo;d like to remind our readers that iOS 5 has already been jailbroken already. iPhone Dev Team member tweeted a screenshot on 7th June showing iSSH (a jailbreak-only app) running on an iPod touch 4G with iOS 5. Today, Redsn0w 0.9.8 was released as a tethered jailbreak for iOS 5 Beta. Instructions on how-to jailbreak iOS 5 can be found here. Even though the jailbreak, as of now, is tethered. But as time goes by, there probably will be an untethered jailbreak available. The DevTeam has shown time and time again just how capable they are and we can trust them to deliver again when iOS 5 comes around. iOS 5 is releasing this fall and there is a lot to look forward to. We&rsquo;ve been covering its official features as well as the hidden ones recently. Stay tuned to us as we inform you of the hidden goodies in iOS 5 that are slowly coming to light. Well it looks like the two teams are competeing. And why is geohot out? You might want to fix or remove that BB code.